Ecological disturbances at Long-Term Ecological Research (LTER) sites are often the result of extreme meteorological events. Among the events of significance are tropical storms, including hurricanes, and extratropical cyclones. Extratropical storms are low-pressure systems of the middle and high latitudes with their attendant cold and warm fronts. These fronts are associated with strong, horizontal thermal gradients in surface temperatures, strong winds, and a vigorous jet stream aloft. These storms and their attendant fronts generate most of the annual precipitation in the continental United States and provide the lifting mechanisms for thunderstorms that, on occasion, spawn tornadoes. Off the United States West and East Coasts, extratropical storms generate winds, wind waves, wind tides, and long-shore currents that rework coastal sediments, alter landscape morphology, and change the regional patterns of coastal erosion and accretion (Dolan et al. 1988). Although extratropical storms do not match hurricanes in either precipitation intensity or in the strength of the winds generated, they are much larger in size and have a more extensive geographic impact. On occasion, extratropical storms will intensify at an extraordinary rate of 1 millibar (mb) per hour for 24 hours or more. Such storms are classed as "bomb" and are comparable to hurricanes. Extratropical storms occur in all months of the year but are most frequent and more intense in winter when the north-south temperature contrast is large and dynamic support for storm intensification from the stronger jet stream aloft is great. In this chapter, we will explore the history of storminess for those LTER sites in the continental United States at which more than a century of data on storms and their storm tracks are readily available. Specifically, we will look at the record of changes in storminess at both the regional and national scales. During the 1990s, significant storms along the U.S. West Coast and droughts and fires in Florida in an El Niño year led to a hypothesis that El Niño and La Niña conditions were associated with a modulation in the frequency of storms. In addition, it has been suggested that the frequency of El Niño and La Niña events and, by inference, storminess, has increased during the past century. Several LTER sites have recorded changes in climatic and ecological states that are coherent with El Niño and La Niña cycles. In this chapter we will examine the record of storminess averaged over all of the El Niño and La Niña events since the mid-1880s relative to these ideas. Concerns about global warming arising from elevated atmospheric carbon dioxide concentrations have led to interpretations of model studies of a world with more storms and with more intense storms resulting in more frequent flooding. Many LTER sites have established research capabilities designed to detect global warming signals in ecosystem dynamics. We will also look at the history of storms relative to the projections of storminess from General Circulation Models (GCMs) in response to elevated atmospheric carbon dioxide. GCM sensitivity in the level of storminess relative to the projected atmospheric carbon dioxide increases will be explored through a study of the historical record of change. Davis et al. 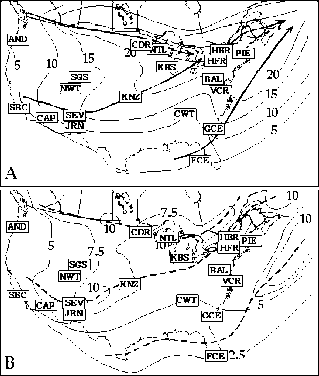 (2000) characterized extratropical cyclones and their nature. An extratropical cyclone is a synoptic-scale, migratory atmospheric disturbance that forms and evolves entirely outside of tropical latitudes. Its horizontal dimensions are on the order of 103km. The most generally recognized manifestation of the extratropical cyclone occurs near the earth's surface in the form of a large region of surface low pressure in which air spirals cyclonically (counter-clockwise in the Northern Hemisphere, reverse in the Southern Hemisphere) and inward to try to fill the depressed region. Large horizontal temperature gradients provide the primary energy source for the disturbance as the potential energy created by these gradients is converted to kinetic energy. The extratropical cyclone is always associated with an upper trough. In a well-developed extratropical cyclone, there is a three dimensional balance, such that air rushing into the system at lower-levels is forced upward to high altitudes, where it diverges out and away from the cyclone's center. The rising motion often gives rise to the inclement weather typical of these storms. Most extratropical storms of the middle latitudes move generally from west to east and may cross the continental United States in 4 to 6 days. The paths taken by these centers of low pressure may be followed from hour to hour and day to day by inspection of surface weather maps. Derivative maps of these tracks can be produced from a sequence of consecutive individual weather maps. The National Weather Service has been publishing such derivative maps of storm tracks on a monthly basis since the early 1880s. In this chapter compilations of monthly storm tracks published by the National Weather Service are summarized by month for 180 latitude and longitude grid cells from southern Canada, the continental United States, and the western North Atlantic Ocean. Archives of maps of monthly storm tracks have been used for more than a century to delineate the climatology of storms. We will focus on the history of storms at LTER sites. Bigelow's study of 1897, Klein's studies of 1951, 1958, and 1965, Hayden's 1975 and 1981 studies, Reitan's work in 1974, and Key and Chan's 1999 report are but a few of the significant compendial studies of monthly storm frequency and storm track climatologies. 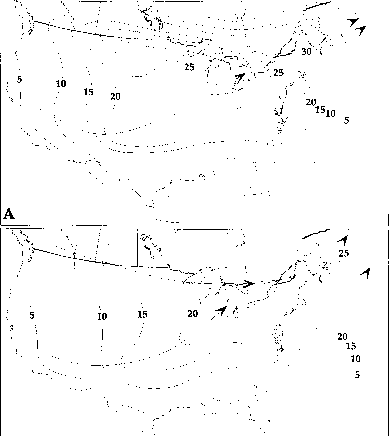 Hosler and Gamage (1956) studied U.S. extratropical cyclone frequencies in 5° latitude and longitude grid cells for the 50 years ending in 1955. They found no evidence in the annual means of periodicities, trends, or shifts in regions of maximum frequency. Reitan (1974) updated Hosler and Gamage's work through the 1960s and reported a general but modest decline in cyclone frequency. Other regional studies have come to opposite conclusions. Hayden (1975), for the period 19421975, showed an increased frequency of storms off the U.S. Atlantic Coast that generate deepwater waves of 1.3 m or greater height. Hayden concluded that the number, severity, and duration of Atlantic Coast storms had increased between 1942 and 1974. Mather et al. (1964) and Resio and Hayden (1975) reported an increase in Atlantic Coast storm severity from the 1920s to the 1960s. Resio and Hayden (1975) attributed the increase in Atlantic Coast storm frequency and magnitude to anticyclonic blocking in the Northern Hemisphere. Dickinson and Namias (1976) related the offshore displacement of the Atlantic Coast storm track, detected in the 1950s, as arising from a general cooling in the U.S. Southeast during the twentieth century and to an expansion of the Northern Hemisphere polar vortex. Hayden (1981) explored the long-term (1885-1978) history of storminess for North America east of the 100th meridian and found large century-long changes in storm frequency characterized by increased storminess off the U.S. Atlantic Coast from 1885-1894 to 1925-1934. The opposite trend was found over the Great Plains. Because these storms eventually track into the high latitudes of the North Atlantic, it is likely that patterns of storms, especially those in the eastern half of North America are related to the North Atlantic Oscillation (NAO). Although the connections to hemispheric atmospheric circulation patterns are not the subject of this chapter, it is clear that the patterns of storm climate change can be put into a larger context. Extratropical storms provide the essential rain and snowfalls that sustain ecological systems and human activities in the middle and high latitudes. The storms also give rise to extreme, damaging levels of precipitation (Uccellini et al. 1995), wind waves (Resio and Hayden 1975), and short-term sea level changes that may result in coastal erosion and sedimentation (Dolan and Hayden 1981), ecosystem changes (Hayden et al. 1995), and the loss of lives and property (Mather et al. 1964; Hayden 1988; Davis and Dolan 1993). These storms, and their associated fronts, provide most of the excess precipitation over evaporation and evapotranspiration during the recharge part of the water year. They are responsible for the snowfalls that build the snow pack and water storage in mountainous areas, and are the main source of water for winter and spring flooding. Hayden (1988) detailed the relationship between flooding regimes and the general circulation of the atmosphere and classified flood regions of the world according to the types of precipitation systems that caused the flooding. Extratropical storms are also responsible for most of the major East Coast snowstorms (Knappenberger and Michaels 1993; Kocin and Uccellini 1990). In general, extratropical storms are central to the problems of and stresses on water resource systems. In addition, on theoretical grounds, if climate change occurs because of increases in carbon dioxide, changes in spatial and temporal patterns in storminess are to be expected. In coastal regions of the United States, these same storms are the proximate cause of beach erosion and the flooding of wetlands with saline waters as well as the maintenance of coastal ecosystems (Dolan and Hayden 1981). Property damage along the U.S. coast from storms at sea occurs each year. It is generally recognized among coastal scientists that with coastal development the risk of property damage from storms has increased yearly (Davis and Dolan 1993). In addition, the current eustatic sea level rise of about 11 mm/yr (Emery and Aubrey 1991) brings the water's edge to a more landward position each year, thus increasing the hazard of storms and the risk of property damage and loss of lives. Two-thirds of the nation's shorelines are eroding (Fenster and Dolan 1994), resulting in a progressively greater exposure of coastal infrastructure to storm wave and storm surge damage. The fundamental aspects of climate change in response to an enrichment of carbon dioxide in the atmosphere have been known since the end of the last century (Arrhenius 1896) and have been confirmed by GCMs in the last two decades. Ar-rhenius found that the high latitudes warm more than the low latitudes, the continental areas warm more than the oceanic areas, the Northern Hemisphere warms more than the Southern Hemisphere, the winter half of the year warms more than the summer half of the year, and the planetary atmosphere becomes generally more moist. In addition, Arrhenius estimated that the bottom 15 km of the atmosphere would warm while cooling occurred at higher altitudes. General Circulation Models show the same pattern that Arrhenius determined in 1896, but GCMs also provide information about pressure and wind fields. The model projections of carbon dioxide-forced climate change indicate warming in the high latitudes more than in the low latitudes. The expected result is a reduced north-south temperature gradient, a smaller circumpolar vortex, and a weaker, more northerly latitudinal position of both the zone of the maximum north-south thermal gradient and the jet stream (Hayden and Dolan 1977; Davis and Dolan 1993). Storms in such an altered climate should, on average, be fewer in number, weaker in intensity, and displaced northward in geographic position. The questions that motivate the present study are, Have there been changes at LTER sites in storminess over the past century? Are the changes consistent or the same nationwide? Is the change in storminess over the past century consistent with GCM projections of climate change based on the increases in carbon dioxide to date? Is there a characteristic pattern of storminess associated with El Niño and La Niña cycles? Figure 14.1 Tracks of the centers of cyclones at sea level, January 1957. Open circles are the positions of storm centers at 7:30 a.m. EST and filled circles are storm positions at 6-hour increments. closed isobars. The storms are accompanied by counterclockwise circulation (in the Northern Hemisphere) and are associated with convection, cloudiness, and precipitation, which are also indicated on the weather maps. This definition of a storm excludes from study storms during their period of cyclogenesis and prior to the circular closure of the isobaric field when central pressures are less than 4 mb lower than the surrounding area. Also excluded by the National Weather Service in their analyses are low-pressure centers that last less than 6 hours. Such incipient or weak storms are, however, not insignificant in the lower midlatitudes, where they may produce significant rainfall and associated thunderstorms. Because rainfall arises from such "prestorm" conditions, especially in the lower latitudes, we must be aware of this problem in the operational definition. Through the study of sequences of weather maps, using analyzed records of barometric pressure at weather stations, the centers of such low-pressure systems are recorded and mapped as storm tracks (figure 14.1). Maps of such storm tracks compiled by month by the National Weather Service are available for the years 1885-1996. Storm frequency (storminess) was tabulated from monthly charts of the "Tracks of the Centers of Cyclones at Sea Level," published by the Monthly Weather Review, Mariners Weather Log, and in recent years provided directly to the authors by the National Weather Service. In the present study of storminess at LTER sites, storms for each year (1885-1996) are tabulated for the 180 2.5°-latitude by 5.0°-longitude grid cells in the study area (25° N to 55° N and 60° W to 125° W). Unfortunately, the National Weather Service can no longer afford to prepare these important charts. The annual totals of cyclones passing through each grid cell were summed from the monthly totals following the procedures of Hayden (1981). Figure 14.2 Annual composites of storm frequencies for four representative years: 1908, 1951, 1962, and 1974. Heavy lines with arrows indicate the dominant storm tracks for the year. 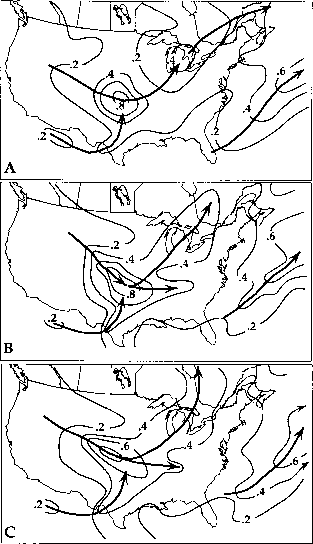 Figure 14.2 shows the pattern of storminess over eastern North America in four example years: 1908, 1951, 1962 and 1974. These years were selected because they illustrate the range of storm track patterns that may occur. In the year 1908, the majority of storms tracked eastward along the northern margin of the Great Lakes. Storm frequencies declined abruptly from the Great Lakes southward. 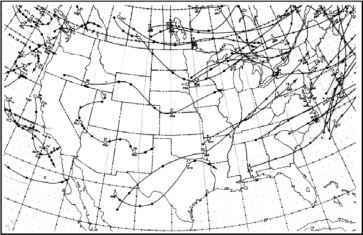 In 1951, the dominant storm track was out of Colorado, extending eastward south of the Great Lakes and exiting the Atlantic Coast near Long Island, New York. In this year there were few storms to the north of the Great lakes in southern Canada (Angel and Isard 1998). The Atlantic Coast storm track dominated in 1962 with very few storms over the interior of the continent. This was one of the stormiest years on record for Atlantic Coast nor'easters. In 1974, the Atlantic Coast storm track was displaced northward and westward of the 1962 position, and a second track of storm is observable along the Ohio Valley, exiting the Atlantic Coast in central New Jersey. Figure 14.3 (A) Time series of average cyclone frequencies (number of storms per year) over the entire study area shown in figure 14.4 and (B) scattergram of mean cyclone frequencies and the standard deviations of mean cyclone frequencies for the study area. storminess from 1885-1996 (figure 14.3A). There is no indication of any overall North American trend in storminess. There is neither a systematic increase in the number of storms since 1885 nor a decrease in storminess for that period. The slope of the regression line is zero. Figure 14.3B shows the relationship between the standard deviation of storm counts in each year and the mean cyclone frequency. Clearly, the variability in storm climate across the years of record is strongly correlated with the number of storms that occurred. For this attribute of climate, there has been no nationwide change in the average occurrence of storms since 1885. We must also conclude from figure 14.3B that the nationwide variability has not changed either. Figure 14.4A shows the spatial variation in the mean number of storms for the entire period of record (1885-1996), and figure 14.4B shows the spatial field of standard deviations about the long-term means. The three-letter acronym of each LTER site identifies the locations of the 19 LTER sites included in this study. The long-term mean frequency of cyclones (figure 14.4A) shows three major storm tracks: (1) the Alberta storm track arising out of southern Alberta and continuing eastward across the northern edge of the Great Lakes and out the St. Lawrence Seaway; (2) the Colorado storm track extending into the Great Lakes and merging with the Alberta storm track in the Great Lakes region; and (3) the Atlantic Coast storm track paralleling the Gulf and East Coasts just a bit offshore. Storms along the Alberta and Colorado storm tracks often decay over the mountains as they come from the west and may reform in the lee of the Rocky Mountains. The formation of storms, cy-clogenesis, is common on the lee side of the mountains at the locations of the Alberta and Colorado storm tracks. Along the Atlantic Coast, such cyclogenesis often occurs just to the east of the coast and along the usual storm tracks. 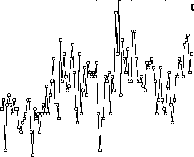 Figure 14.4 Long-term (1885-1996) mean storm frequencies (A) and standard deviations (B). The units are storms per year. Arrows in panel A indicate the long-term mean storm tracks. The dashed lines in panel B show the locus of maximum storm frequency variability. The locations of LTER sites are shown and indicated by the three-letter acronym for the sites. ability in annual storm frequency. The axis of maximum variability along the Atlantic Coast is displaced southward and eastward (seaward) of the axis of the storm track itself. This displacement undoubtedly accounts for some of the scatter of points in figure 14.3B. Caution is in order regarding the three storm tracks shown in figure 14.4A. The senior author, in a study of the patterns of storm tracks in each of the 112 years of record, found few years in which all three storm tracks were present in the annual mean statistics for individual years. In particular, years when both the Colorado and Atlantic storm tracks are frequented by storms are rare. Thus, figure 14.4A must be viewed as a time-integrated composite that is not often realized in individual years. Nineteen of the 24 LTER sites lie within the middle latitudes, where extratropical storms are the dominant meteorological and ecosystem disturbance events. Al though there is no apparent national trend in storm frequency or variability during the twentieth century, it does not follow that regional trends do not exist. However, nationally, the sum of all such regional trends must balance out. For the purpose of detailing the histories of storminess at LTER sites, the sites have been grouped into regions with common storm tracks and where common temporal patterns of storminess are found. Five regions are defined: the West Coast, the Interior West, the Midwest, the Appalachians, and the East Coast. The West Coast LTER sites are at Santa Barbara, California, and Andrews Experimental Forest, Oregon. Figure 14.5 shows the time history of storm frequencies in the latitude by longitude grid cells that contain each West Coast LTER. In addition, the time series of storms for the Puget Sound area is shown because storms (indicated by a center of low pressure) coming ashore at this location and to the north produce wintertime rainfall as far south as San Diego, California. In the Puget Sound area (figure 14.5A), storm frequencies were highest near the turn of the century and declined somewhat until the middle of the century. Missing data for the 1960s, however, limits our confidence in this observation. At the H. J. Andrews Experimental Forest LTER site (figure 14.5B), the average annual number of storms is about five, and there are no secular trends in storminess between 1885 and 1996. Although five storms for this stormy coast seems to be very low, we must remember that the West Coast is significantly impacted by storms that come ashore far to the north along the British Columbia and southern Alaska coasts as the trailing fronts. Such fronts from these storms produce rainfall all along the West Coast. The centers of these eastward-moving storms, however, occur infrequently in the southern sections of the West Coast, and then mostly in the winter months. Santa Barbara Coastal Ecosystems LTER site (figure 14.5C) exhibits a pattern much like areas to the north, with an annual average number of storms around four per year. Like points to the north, there is little if any indication of secular change in storm frequency in southern California during the twentieth century. Although these data do not contain information on storm intensity, there is generally a log-linear relationship between storm intensity and storm frequency. Years with many storms are more likely to have intense storms. We would not expect to find a historical trend in storm intensity along the U.S. West Coast if such data were available because there is no trend in the total number of occurrences. Figure 14.5 The number of storms per year in the Puget Sound area (A), the Andrews LTER site (B), and the Santa Barbara LTER site (C). Storm frequencies are given in storms per year. The latitude and longitude grid cell used to tabulate storm frequencies is shown in each panel. 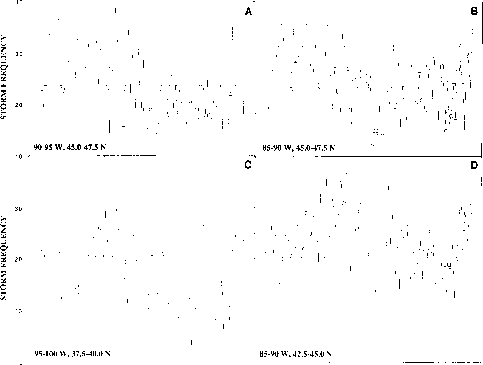 Figure 14.6 The number of storms per year at the Niwot Ridge LTER site (A), the Short Grass Steppe LTER site (B), the Central Arizona Phoenix LTER site (C), and the Jornada and Sevilleta LTER sites (D). Storm frequencies are given in number of storms per year. The latitude and longitude of the grid cell used to tabulate storm frequencies is shown in each panel. icant changes in the snowpack in the mountains of the area. A similar pattern is seen at the Short Grass Steppe (figure 14.6B). Storm frequencies doubled between 1885 and 1930 and declined by that much or more in the decades that followed. In the case of the Phoenix LTER site (figure 14.6C), the rise in storm frequencies from 1885 to 1930 amounted to an increase of nearly 10 storms per year to be followed by a decline of about the same to the middle of the century. This change amounts to more than twice the year-to-year variation in storm frequency, a large climate change by any standard. At the Sevellita and Jornada LTER sites, storm frequencies increased from around 5 per year in the 1880 to around 15 storms per year by the 1920s and declined thereafter. Because the number of cyclones is low in the lower latitudes and high in the higher latitudes, the 10-storms-per-year change in New Mexico is a very large increase—300%. In contrast, the 20-storms-per-year increase at the Niwot LTER site is "only" a 100% increase. In any case, these are very large climate changes. Each of these five LTER sites have seen significantly increased storminess over the past two decades. In addition, the form of these four time series of storm frequencies (figure 14.6) resembles that of the record of Northern Hemisphere global temperature. This history implies that when the Northern Hemisphere warms the interior of the United States, the west experiences increased storminess. If the recent history of warming is the result of human enrichment of the atmosphere with carbon dioxide giving rise to the northward displacement of the zone of greatest thermal contrast (as projected by climate models), then we would expect fewer rather than more storms during periods of warming. At this point, we cannot make a good case for a causal link between storminess at these western LTER sites and the observed history of Northern Hemisphere warming. Figure 14.7 The number of storms per year at the Cedar Creek LTER site (A), North Temperate Lakes LTER site (B), the Konza Prairie LTER site (C), and Kellogg Biological Station LTER site (D). Storm frequencies are given in storms per year. The latitude and longitude of the grid cell used to tabulate storm frequencies are shown in each panel. decades with frequent storms should exhibit large year-to-year variability in storm frequency. Hubbard Brook, Harvard Forest, Baltimore, and Coweeta LTER sites are grouped into the Appalachian region. These LTER sites lie between the Colorado and Atlantic Coast storm tracks. Hubbard Brook (figure 14.8A) and Coweeta (figure 14.8C) exhibit little if any systematic climate change. Indeed, the year-to-year variations at these sites greatly exceeds any century-long variation in storm frequencies that might be present. At the Harvard Forest (figure 14.8B) and Baltimore (figure 14.8D) LTERs, there are clear indications of an upward trend in storm frequencies from the beginning of record to the 1990s. In the case of Harvard Forest, the numbers of storms has increased from around 15 per year to 25 per year. At the Baltimore LTER site, an increasing trend of about 10 storms per year is evident. This upward trend in storminess becomes more pronounced as we move east of the Appalachians toward the coastal LTER sites and the marine environment. There are four LTER sites along the U.S. Atlantic Coast: Plum Island, Virginia Coast Reserve, Georgia Coast, and the Florida Everglades. Each of these sites is influenced by storms along the Atlantic storm track. The time series of storminess for these LTER sites for the past century are shown in figure 14.9. Changes in century-long storm frequency are very pronounced. At Plum Island LTER (figure 14.9A), the amplitude of change amounts to more than 25 storms per year, with a low of 10 storms per year around the turn of the century to 30 or 35 storms per year in recent decades. A strong climate change in storminess is clearly evident. At the Virginia Coast Reserve LTER (figure 14.9B), the change in storm numbers amounted to 15 storms per year from 1885 to 1990. The magnitude of storm change since 1885 declines as we move southward. At the Georgia Coast LTER (figure 14.9C), the amplitude of change is about 8 storms per year. Although this change is modest, it has been systematic over the past century with a nearly linear trend. Little if any trend in storm numbers is evident at the Florida Everglades LTER (figure 14.9D). However, much of the freshwater passing through the Everglades of southern Florida, arises in northern Florida and much of the winter rain across Florida comes from storm centers passing even farther to the north. Also, rainfall from storms that do not pass the threshold used in this study often produce a large amount of rainfall at these low latitudes. Figure 14.8 The number of storms per year at the Hubbard Brook LTER site (A), Harvard Forest LTER site (B), the Coweeta LTER site (C), and the Baltimore LTER site (D). Storm frequencies are given in storms per year. The latitude and longitude of the grid cell used to tabulate storm frequencies is shown in each panel. Figure 14.9 The number of storms per year at the Plum Island LTER site (A), Virginia Coast Reserve LTER site (B), the Georgia Coastal Ecosystem LTER site (C), and the Florida Everglades Ecosystem LTER site (D). Storm frequencies are given in storms per year. The latitude and longitude of the grid cell used to tabulate storm frequencies is shown in each panel. Figure 14.10 Average storm frequency and dominant storm tracks (arrows) for El Niño years between 1885 and 1940 (A) and for El Niño years between 1940 and 1996. El Niño events during the 1960s are not included because of missing storm track data. fewer large storm should be evident and the year-to-year variability should decline as well. Because there exist large storm climate changes at the time scale of the length of the record of data used in this study and because there are suggestions that the El Niño and La Niña events are becoming more frequent, the analysis of storminess during El Niño and La Niña periods is divided into two periods: before 1940 and after 1940. The two panels in figure 14.10 compare El Niño storminess patterns in the early period of record to those in more recent decades. The El Niño and La Niña events of the 1960s were not included in this study because of missing data for the western United States during the 1960s. Figure 14.10A shows the spatial field of average annual extratropical cyclone frequencies for six El Niño episodes before 1940 (1888-1889, 1905-1906, 1911-1912, 1914-1915, 1919-1920, and 19251926). Figure 14.10B shows the spatial field of average annual storm counts for seven El Niño events after 1940 (1940-1941, 1951-1953, 1977-1978, 1982-1983, 1986-1987, 1991-1992, 1993-1994). The Atlantic Coast storm track is displaced seaward in the latter period compared to the pre-1940 portion of the record. The differences in the two periods, however, are not the result of instability or a fundamental signature of storminess in El Niño periods. Rather, there is a confounding in the data due to the very large centennial-scale changes in storm climate that have occurred over the course of the past century. The storm climate of earlier decades of the period of record is fundamentally different from those of more recent decades. 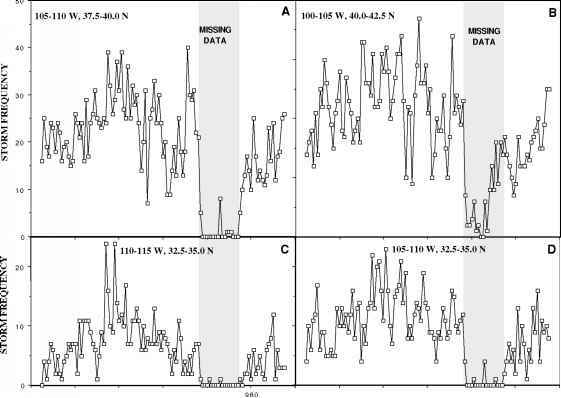 A comparison of figure 14.10A,B with figure 14.4A leads to the conclusion that pattern of storminess over North America during El Niño years is not different from the pattern of storms averaged over the period of record (112 years). The case for increased El Niño storminess along the California coast as a signature of El Niño events cannot be made from data on storm counts taken from weather maps by the National Weather Service. Figure 14.11 provides an analysis of storminess patterns during La Niña episodes. The spatial field of average annual extratropical cyclone frequencies for six La Niña episodes before 1940 (1889-1890, 1989-1899, 1909-1910, 1921-1922, 19281929, and 1937-1938) are shown in figure 14.11A. Figure 14.11B shows the spatial field of annual average storm counts for five La Niña episodes after the 1940 period of the record (1943-1944, 1949-1950, 1954-1955, 1975-1976, and 1988-1989). With the exception of a displacement of storms offshore along the Atlantic Coast in the post-1940 period, no differences can be seen between La Niña events before and after 1940. As was the case for the analysis of El Niño, we find no substantive difference between storminess during La Niña years and an average year for the entire period of record (figure 14.4A). Comparison of figures 14.10 and 14.11 provides an opportunity to examine differences during storminess in El Niño years with storminess during La Niña years. Storminess patterns for the 112 years of record are no different in El Niño or La Niña years. It is probable that news-media reports of El Niño and La Niña storm patterns are based on the vivid memory of the recent events and thus conclusions are drawn based on a modest sample size. This, however, does not mean that there is no El Niño/La Niña signal in rainfall statistics. Closed isobar storms along the southern states from Southern California to Florida are not common, but rainfall during the period of cyclogenesis leading up to a definable cyclone is often substantial. In addition, rainfall arising from frontal systems associated with cyclones may exhibit an El Niño/La Niña signal. The present study indicates only that developed cyclones over the continental United States do not exhibit a distinct El Niño/La Niña signal. 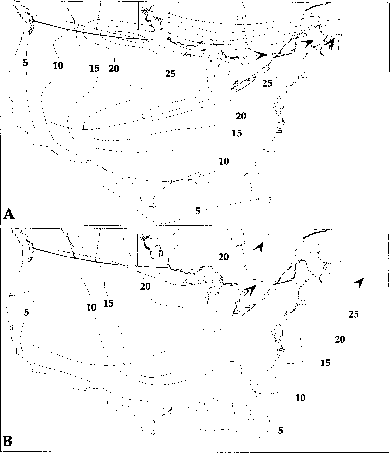 Figure 14.11 Average storm frequency and dominant storm tracks (arrows) for La Niña years between 1885 and 1940 (A) and for La Niña years between 1940 and 1996 (B). La Niña events in the 1960s are not included because of missing storm track data. 1992, 1994). Extratropical cyclones under such a regime should be fewer in number and displaced northward on average. Figure 14.3A clearly indicates that, to date, there has been no trend in the number of cyclones over North America during the twentieth century. In addition, there is no evidence for a change in the variability of storminess over North America at the continental scale. Davis et al. (2000) suggested that an increase in Ohio Valley storms and a decrease in Atlantic Coast storms, as seen in figures 14.7 and 14.9, is consistent with a preferential warming of the continent and a reduced thermal contrast across the U.S. Atlantic Coast. Storm data from the Hadley Center General Circulation Model (HADCM2) have been used to build scenarios of the nature of storm climate in a carbon dioxide-enriched world (Johns et al. 1997; Carnell et al. 1996). Thirty-year average HADCM2 indexes of storminess centered on the years a.d. 2005, a.d. 2020, and a.d. 2085 prepared for the U.S. National Assessment of Climate Change are used here. The spatial fields of the 30-year average storm counts for the three times are plotted in figure 14.12. Average HADCM2 storm frequency index values for the 30 years centered on a.d. 2005 are thought to be representative of current atmospheric conditions; however, figure 14.12A differs from the observed record in fundamental ways. In the a.d. 2005 HADCM2 model output, the Alberta Storm track is not revealed at all. The Colorado storm track is delineated well, but the strong, bulls-eye maximum in Colorado is not found in the observational record of storm frequencies derived from weather maps. This maximum is probably fixed in this location because dynamic/orographic interactions gave rise to excessive, downstream cyclogensis in the lee of the Rocky Mountains. The storms tracking out of northern Mexico in the model ouptut data are not a feature found in the observational record. The Atlantic Coast storm track is found in the model output but is displaced much farther offshore than observed in the historical record. The current version of the model used in this assessment (HADCM2) does not produce a geography of storm tracks that is congruent with the observed pattern of storminess over North America. 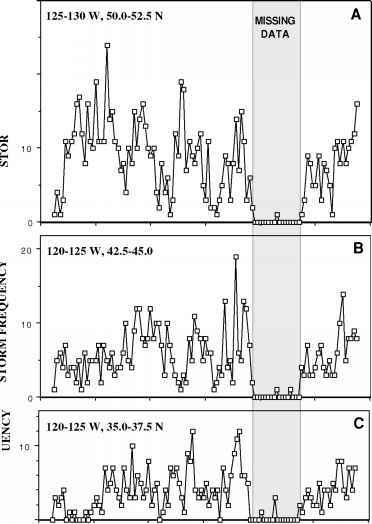 Figure 14.12 Charts of an index of storm frequency and storm tracks (arrows) derived from the Hadley Center's General Circulation Model (HADCM2) for the average 30-year periods centered on (A) 2005, (B) 2020, and (C) 2085.
the general circulation of the atmosphere, how then are parameterized output variables of the model such as precipitation and related hydrological processes to be estimated with confidence? Storm frequencies have changed over much of the continental United States since 1885. Very large changes in storm frequency are found at most LTER sites. However, when averaged over the entire continental United States, no net change in storminess is detected. We also conclude that there has been no change in the variability of storminess on a national basis. The storm climate changes observed at the 19 LTER sites are regional in nature and are very large in magnitude. Although we can be confident that storm climate has changed, we are less able to detail the consequences such as flooding or drought, erosion or deposition, and diminished or enriched water supply. These consequences require detailed site-specific study. El Niño/La Niña variations in storminess were not detected either nationally or regionally. This conclusion is based on the analysis of all El Niño and La Niña events since 1885, with the exception of the 1960s for which data are missing. We conclude that indications of patterns of El Niño and La Niña storminess arose from a very limited sample size. The patterns of change in storminess at the 19 LTER sites were not consistent with theoretical expectations for a world with greater warming in the high latitudes than in the low latitudes as expected from an atmosphere enriched with carbon dioxide. We also conclude that the current generation of atmospheric General Circulation Models do not generate any changes in storminess patterns for the next 100 years. Angel, J. R., and S. A. Isard. 1998. The frequency and intensity of Great Lakes cyclones. Journal of Climate 11:1861-1871. Arrhenius, S. 1896. On the influence of carbonic acid in the air upon the temperature of the ground. The Philosophical Magazine and Journal of Science 41(251):237-276. Bigelow, F. H. 1897. Storms, storm tracks and weather forecasting. Weather Bureau Bulletin 20(114):5-87. Carnell, R. E., C. A. Seniro, and J. F. B. Mitchell. 1996. An assessment of measures of storminess: Simulated changes in Northern Hemisphere winter due to increasing CO2. Climate Dynamics 12:467-476. Davis, R. E., and S. R. Benkovic. 1992. Climatological variations in the Northern Hemisphere circumpolar vortex in January. Theoretical and Applied Climatology 46:63-73. Davis, R. E., and S. Benkovic 1994. Spatial and temporal variations of the January circumpolar vortex over the Northern Hemisphere. International Journal of Climatology 14:415-428. Davis, R. E., and R. Dolan. 1993. Nor'easters. American Scientist 81:428-439. Davis, R. E., P. J. Michaels, and B. P. Hayden. 2000. Overview of extratropical cyclones. Pages 401-426 in R. A. Pielke, Sr. and R. A. Pielke, Jr., editors. Storms. Routledge, New York. Dickinson, R., and J. Namias. 1976. North American influences on the circulation and climate of the North American sector. Monthly Weather Review 104:1255-1265. Dolan, R., and B. P. Hayden. 1981. Templates of change: Storms and shoreline hazards. Oceanus 23(4):32-37. Dolan, R., H. Lins, and B. P. Hayden. 1988. Mid-Atlantic coastal storms. Journal of Coastal Research 4(3):417-433. Emery, K. O., and D. G. Aubrey. 1991. Sea levels, land levels and tide gauges. Springer-Verlag, New York. Fenster, M. S., and R. Dolan. 1994. Large-scale reversals in shoreline trends along the U.S. mid-Atlantic coast. Geology 22(6):543-546. Hayden, B. 1975. Storm wave climates at Cape Hatteras, North Carolina: Recent secular variations. Science 190:981-983. Hayden, B. P. 1981. Secular variations in Atlantic coast extratropical cyclones. Monthly Weather Review 100(1):159-167. Hayden, B. P. 1988. 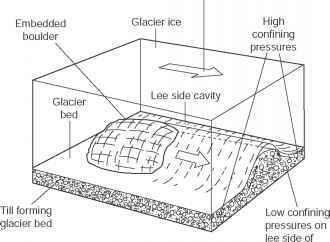 Flood climates. Pages 13-27 in V. R. Baker, R. C. Kochel, and P. C. Patton, editors. Flood geomorphology. Wiley, New York. Hayden, B. P., and R. Dolan. 1977. Seasonal changes in the planetary wind system and their relationship to the most severe coastal storms. Geoscience and Man 18:113-119. Hayden, B.P., M. C. F. V. Santos, G. Shao, and R. C. Kochel. 1995. Geomorphological controls on coastal vegetation at the Virginia Coast Reserve. Geomorphology 13:283-300. Hosler, C. L., and L. A. Gamage. 1956. Cyclone frequencies in the United States for the period 1905-1954. Monthly Weather Review 84:388-390. Johns, T. C., R. E. Carnell, J. F. Crossley, J. M. Gregory, J. F. B. Mitchell, C. A. Seniro, S. F. B. Tett, and R. A. Wood. 1997. The second Hadley center coupled ocean-atmosphere GCM: Model description, spinup and validation. Climate Dynamics 13:103-134. Key, J. R., and A. C. K. Chan. 1999. Multidecadal global and regional trends in 1000 mb and 500 mb cyclone frequencies. Geophysical Research Letters 26(14):2053-2056. Klein, W. H. 1951. A hemispheric study of daily pressure variability at sea level and aloft. Journal of Meteorology 8:332-346. Klein, W. H. 1958. The frequency of cyclones and anticyclones in relation to the mean circulation. Journal of Meteorology 15:98-102. Klein, W. H. 1965. Application of synoptic climatology and short-range numerical prediction to five-day forecasting. Weather Bureau Research Paper No. 46, 109 pp. Knappenberger, P. C., and P. J. Michaels. 1993. Cyclone tracks and wintertime climate in the mid-Atlantic region of the USA. International Journal of Climatology 13:509-531. Kocin, P. J., and L. W. Uccellini. 1900. Snowstorms along the northeastern coast of the United States 1955-1985. Meteorological Monographs 22(44), 280 pp. Manabe, S., Stouffer, R. J., Spelman, M. J., and K. Bryan. 1991. Transient Responses of a Coupled Ocean-atmosphere Model to Gradual Changes of Atmospheric CO2. Journal of Climate 4:785-818. Mather, J., H. Adams, and G. Yoshioka. 1964. Coastal storms of the eastern United States. Journal of Applied Meteorology 3:693-706. Reitan, C. H. 1974. Frequencies of cyclone activity over North America 1951-1970. Monthly Weather Review 102:961-868. Resio, D., and B. Hayden. 1975. Recent secular variations in mid-Atlantic extratropical storm climate. Journal of Applied Meteorology 14:1223-1234. Aerosols and Greenhouse Gases. Nature 369:734-737. Uccelini, L. W., P. J. Kocin, R. S. Schneider, P. M. Stolkols, and R. A. Dorr. 1995. Forecasting the 12-14 March 1993 superstorm. Bulletin of the American Meteorological Society 7(2):183-199.